Have you ever wished that you had a long-lost twin sister? I think most of us have. The wish is even more poignant for someone like Emma, who has spent most of her hard, lonely life in and out of foster homes. The idea that someone would know you intimately and love you unconditionally is understandably enticing to Emma. And her wish comes true! She discovers that she has a twin sister named Sutton in Tucson. Her dreams are quickly dashed when she goes to meet Sutton only to discover that Sutton is dead and the killer is after her too. Emma has to pretend to be Sutton to stay alive. Emma is a simple, likeable girl. Despite her hard life, she's kind, timid, and relatively innocent. She makes a good vessel through which the story can be told. The reader can't help but root for Emma. Sutton is essentially two different people. Part of The Lying Game is told through Sutton's eyes from the beyond. Somehow when Sutton died, her memories were completely erased. She's viewing her own life as a stranger. In death, Sutton seems like a nice, quiet girl. A big contrast to the living Sutton. She was the sterotype of a mean girl. Pretty, popular, athletic. But principally, mean. She and her friends concocted a Lying Game each year where they would basically torture each other for fun. That's in addition to the cruel jokes they would play on other people. Sutton was rude to her classmates, her friends, and her family. Definitely not a likeable character. It's interesting to see Emma, certainly not a "mean girl" have to transform into Sutton while still remaining true to herself. The story moves quickly through Emma's introduction into Sutton's world. It becomes clear quickly that someone is still after Sutton. There are so many people who it could be - Sutton wasn't short on enemies. Could it be a stranger, a friend, or even a family member? All seem possible. The Lying Game takes the reader on a ride as we try to figure out who, if anyone, Emma can trust. My main problem with this book is that it is so incomplete. The Lying Game is the start of a series. The reader is left with tons of questions at the end of this book. I don't mind being left wondering about certain aspects of a world, but I like a book that can somewhat stand on its own. This definitely cannot. There are a lot of crucial pieces of information that I didn't know by the end of the novel. Not cliff-hanger material, but big background information. I prefer first books that build the world substantially, not just introduce it. I'd rather be enticed to read the next book with a cliff-hanger than unanswered questions. 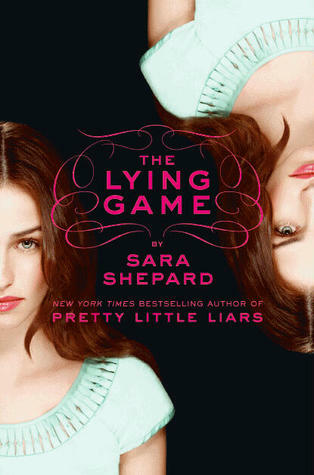 My issues aside, The Lying Game was a quick read, full of mystery and suspense. I'm excited to read the next one to learn more about Sutton and Emma's worlds. Sounds good. I may pick this one up at some point. Great review. I agree, I don't mind cliffhangers, bu I have to feel like I've been given some answers and information. I also like to have the world of the novel clearly defined by the end of the first book if it's a series. I'm sorry it was so incomplete! I hate when they are. I agree that they should somewhat be able to stand on their own. Based on the description though, it does sound really interesting. I was really frustrated with this one. I would only read the second one if someone told me there were some explanations or resolutions. After reading some of the Pretty Little Liars books I think I've learned not to pick up any Sara Shepard books until the whole series has been published. I'm glad to hear you liked the story so far. Yup, when I first read that the book couldn't stand alone as its own story, I got turned off. I mean, background info is what creates the story! Agh! This has been on my TBR list for a while and I absolutely hear where you are coming from that the first book in a series really should build the world completely. Hmm... maybe I'll wait until the next book comes out? Great review!